People always thought that being a blogger is EASY, the truth is NOT EASY! Nothing easy if you don't work hard for it. I am not a full time blogger, so my time is LIMITED. photo-shooting model for online store on the weekends. night to blog and make my Youtube videos and editing usually takes up half a day. fully utilized my time to do something I like a lot. Frankly speaking, not all blogpost is paid. and tried myself before sharing it with my followers. or even though I don't have enough time for myself. Afterall, is MY CHOICE and I enjoy what I choose to be. I glance through the news and I was mind blown with her statement! According to her, she said that she took 100 photos just for the similar post to try to make her stomach look good and hardly eaten for that day. I can't figure out why she put the blame on social media? then I seriously don't get her logic. then I am blaming my boss and colleagues for that? Why not put it this way, replace her sister with a tripod, retaking the photos by herself, and workout to get the better looking stomach that you desire. Get the problem FIXED instead of complaining on social media that everything is NOT REAL. Everyone hope to looks good and post things that makes herself feels happy. work hard on things that I am not good into. Ask yourself, will you post your worst photo on the internet? she wasn't happy with the lies and she said everyone should know. Firstly, I think this is a fair trade, and it is an advertisement after all. Again, your choice to take up this deal, so stop complaining. but your company pays your salary. Either you shut up and work, or just quit your job. erm, base on your logic, they do it for free? Many big brands even announced that how much they spent on every endorsement. Public knows well about all these, you don't have to stressed on this paid advertisement. If you wanted to be real, you can always be real in social media as well. Nothing wrong with social media, but you are the one who should improve. If you wanted to quit and feel what you had done is worthless, just quit silently. And posting a video with emotional (she cries) about telling "the truth" makes her to get even more attention than she ever had before. 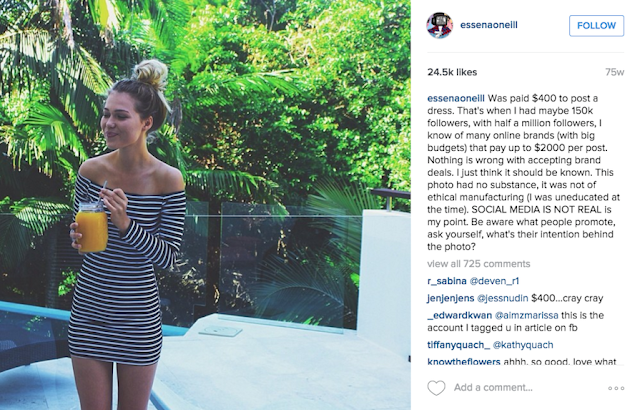 Everyone was sharing in Facebook, with free publicity and now everyone know who is Essena O’Neill.